The Anastasian Wall (Greek: Ἀναστάσειον Τεῖχος, Turkish: Anastasius Suru) or the Long Walls of Thrace (Greek: Μακρὰ Τείχη τῆς Θράκης, Turkish: Uzun Duvar) is an ancient stone and turf fortification located 64 km (40 mi) west of Istanbul, Turkey built by the Byzantines during the late 5th century. 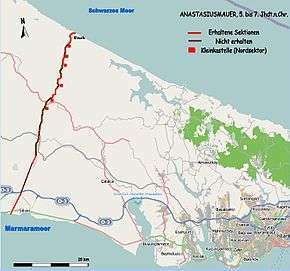 Originally some 56 km (35 mi) long, it stretches from Evcik İskelesi in Çatalca at the Black Sea coast across the Thracian peninsula to the coast of the Sea of Marmara at 6 km (3.7 mi) west of Silivri (ancient Selymbria). It ran from north to south through the locations what are today Karacaköy, Gümüşpınar, Pınarca, Kurfallı, Fener, Alipaşa Neighborhood and Silivri Altınorak. Remains of the wall are visible in Gümüşpınar junction in Karacaköy, Hisartepe in Yalıköy, Pınarca in İhsaniye and Kurfallı village. The wall was part of an additional outer defense system for Constantinople, capital of the Eastern Roman Empire and probably continued in use until the 7th century. The wall was named after the Emperor Anastasius I (r. 491–518). However, there is evidence that the fortification already existed in 469 during the reign of Leo I (r. 457-474) and in 478 in the era of Zeno (r. 476–491), and it was maintained and renewed by Anastasius in the time from 507 to 512. The wall had a thickness of 3.3 m (11 ft) and a height over 5 m (16 ft). It was built complete with towers, gates, forts, ditches and a military way to protect Constantinople from invasions from the west by Huns, Slavs and Bulgars. A rectangular castrum with dimensions of 250 m (820 ft) by 300 m (980 ft) existed also in the central section of the wall. It is known that the wall had only a limited effectiveness, and the barbarians penetrated it many times, because the fortification's length made it difficult to defend the wall completely by a limited garrison, and also because the wall was not sufficiently strong due to its construction in haste. The wall fell into ruin after it was abandoned in the 7th century because of the difficulty of keeping it manned and repaired. Over the centuries, the stone of more than half of the total length was reused in other local buildings. It is best preserved in the woodlands of the northern sector. The Anastasian Wall is an almost unknown example of monumental linear fortification dating from antiquity in continental Europe, next only to Hadrian's Wall (122 AD) in England in its complexity. ↑ "Tarihi Eserler-Anastasios Surları" (in Turkish). Çataca Belediyesi. Retrieved 2013-06-16. Wikimedia Commons has media related to Anastasian Wall.